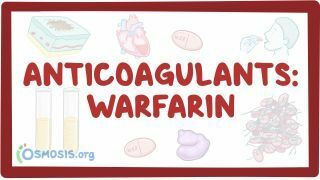 Osmosis: Anticoagulants: Warfarin. (2019, April 24). Retrieved from (https://www.osmosis.org/learn/Anticoagulants:_Warfarin). Warfarin is an anticoagulant normally used in the prevention of thrombosis and thromboembolism. Its mechanism of action is to interfere with the γ-carboxylation of vitamin K–dependent clotting factors II, VII, IX, and X, and proteins C and S. Some adverse effects include bleeding and skin necrosis. Warfarin has several drug-drug interactions since it is metabolized by a common CYP 450 enzyme in the liver. Vitamin K can be given to reverse warfarin's anticoagulation effects, however, fresh frozen plasma is given in more rapid and urgent situations. Bone deformities, fetal hemorrhage, abortion, and abnormalities are the teratogenic effects of warfarin. A 65-year-old man is found to have a deep venous thrombosis in the right common femoral vein post-operatively following a right total hip replacement. He is initially placed on a weight-based heparin protocol and remains in the hospital for three days without further complications. He is discharged home with an oral medication to continue anticoagulation therapy. Two days following discharge, the patient presents to the emergency department with a necrotic skin lesion of the left lower extremity, as shown in the exhibit. His skin findings are most likely due to which of the following?